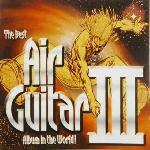 This page includes full details of the three 'Air Guitar' albums, plus the 'Best Of' compilation, which were released between 2001 and 2005 and were compiled by Brian May. In total, these CD's feature four Queen tracks ('Now I'm Here', 'Bohemian Rhapsody', 'Tie Your Mother Down', and a live version of 'Fat Bottomed Girls' by Queen + Paul Rodgers) and two Brian tracks (a live version of 'God Save The Queen' from Party At The Palace, and 'Have A Cigar' with Foo Fighters). A related album, 'Air Guitar Anthems', was released in 2016 and was also compiled by Brian, which featured 'Bohemian Rhapsody', 'We Will Rock You', and 'Parisienne Walkways' by Brian and Kerry Ellis. Released on 5 November 2001, reached number 5, on chart for 7 weeks, and achieved (at least) Gold status. Compiled by Brian May, Pete Malandrone and Justin Shirley-Smith, in collaboration with Steve Pritchard. Engineered by Justin Shirley-Smith and Kris Fredriksson. From an original idea by Pete Malandrone. Sleeve notes by Brian May. Cover concept by Tex and Brian May. Released on 18 November 2002. Unknown chart position or weeks on chart, but achieved platinum status. Compiled by Brian May, Pete Malandrone and Justin Shirley-Smith, in collaboration with Ashley Abram and Steve Pritchard. Engineered by Justin Shirley-Smith, Kris Fredriksson and Ashley Abram. Cover concept by Virgin, Sonicon and Brian May. Released in May/June 2003. 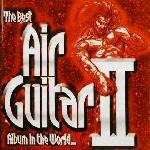 This is a double album (4-CD) set which contains the first two Air Guitar albums, housed in a card slipcase. Released on 24 November 2003. Unknown chart position or weeks on chart. Cover concept by Brian May, Tex, Derek and Virigin. Dedicated to the memory of David John Evans (Nobby to his mates). Released on 28 November 2005. Unknown chart position or weeks on chart. Compiled by Brian May, Pete Malandrone and Ashley Abram. Cover concept by Brian May and Tex. Dedicated to the memory of Tommy Vance. Brian's special thanks to Eric Clapton and Cecil. Released on 18 November 2016. Unknown chart position or weeks on chart.